Located on the Iberian Peninsula and southwestern Europe, Spain or the Kingdom of Spain (official name) is bordered to the south and east by the Mediterranean Sea except for a small land boundary with Gibraltar; to the north by France, Andorra, and the Bay of Biscay; and to the northwest and west by the Atlantic Ocean and Portugal. Spanish territory also includes the Balearic Islands in the Mediterranean, the Canary Islands in the Atlantic Ocean off the African coast, and two autonomous cities in North Africa, Ceuta and Melilla, that border Morocco. Furthermore, the town of Llívia is a Spanish exclave situated inside French territory. With an area of 504,030 square kilometres (194,610 sq mi), it is the second largest country in Western Europe and the European Union after France. Spain had a long history of almost 800 years of Moorish Muslim rule which gradually faded and replaced by the Christian kingdoms, finally extinguishing the last Muslim remnant in Granada in 1492, the same year Columbus reached the Americas. Spain is a democracy organized in the form of a parliamentary government under a constitutional monarchy. It is a developed country with the twelfth largest economy in the world by nominal GDP, and very high living standards (20th highest Human Development Index), including the tenth-highest quality of life index rating in the world, as of 2005. It is a member of the United Nations, European Union, NATO, OECD, and WTO. The first stamps of Spain were issued on 1 January 1850 and depicted Queen Isabella I. My collection of Spanish stamps has some 100 stamps, some of which are displayed above. I will share the remaining shortly. All stamps date back to the 1970s and before. 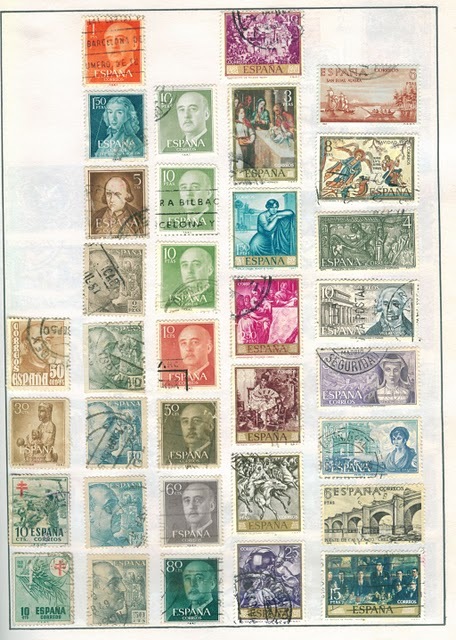 Prominent are the stamps with head of Francisco Paulino Hermenegildo Teódulo Franco y Bahamonde (1892-1975), simple known as Francisco Franco in the second and the third column from the left which were printed and issued in 1954 onwards. He was the king of Spain from 1936 to 1975 till the time of his death.